A storm rages. 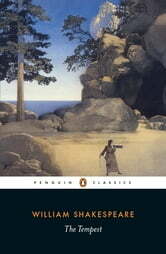 Prospero and his daughter watch from their desert island as a ship carrying the royal family is wrecked. Miraculously, all on board survive. Plotting, mistaken identities, bewitching love and drunkenness follow as the travellers explore the strange place of spirits and monsters on which they have landed. They soon begin to realize all is not as it seems.